VistaCare provided hospice care services through interdisciplinary teams of physicians, nurses, home healthcare aides, social workers, and spiritual and other counselors and volunteers in the United States. RA Capital was engaged by VistaCare’s board of directors to perform a strategic alternatives review of the company. The board determined that a parallel path (implementation of a restructuring plan and exploration of a sale) was the preferred course of action. 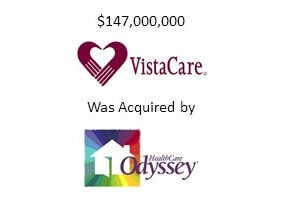 After the conclusion of a broad auction process, VistaCare announced its sale to Odyssey Healthcare, a hospice services company based in Atlanta, GA. The resulting transaction generated an attractive valuation for VistaCare shareholders, including a 23% premium to the stock price at announcement.